Is smart data feeding the rise of smart cities? The Internet of Things will be the backbone of tomorrow's smart cities. We hear about the Internet of Things (IoT) every day and the ubiquitous way it weaves itself into our lives. Businesses, governments, and consumers around the world are all impacted by the IoT and looking to harness its benefits to the same ultimate goal - improve quality of life. Seagate and IDC have revealed that by 2025, an average connected person anywhere in the world will interact with connected devices nearly 4,800 times per day – basically one interaction every 18 seconds. What does this mean for business leaders, policymakers and the general public? Businesses are fundamentally looking to improve operational efficiencies and provide better quality customer experiences with the IoT. For example, brands like Mastercard have adapted their business models - from person-to-merchant transactions to merchant-to-device, and device-to-device transactions - to accommodate the growing pervasiveness of IoT in everyday life. Investments have been made to ensure that there is seamless communication within the ecosystem on both the business process and consumer interaction. In order to provide customers with a frictionless experience that removes the need for multiple logins and passwords, the brand works with its customers to create a single sign-on login and authentication method to connect multiple devices and ensure safe transfer of data and payment. This commitment to improving customer experience and utilising the IoT is reflected in the fact that 60% of all the world’s data in 2025, will be created by enterprises – and is also evidence that businesses must embrace the opportunities presented by smart data. The effectiveness of the IoT hinges heavily on the availability of data analytics – it is this component that helps governments and businesses derive value from all the data that is collected. In London - one of the top three smart cities globally – it is reported that there is a human to camera ratio of 11:1, meaning a total of more than 750,000 cameras given the population of London is over 8.5 million. These cameras and the growing number of sensors across the capital provide a wealth of data points for the city to analyse and use. Across the UK more widely, the government has a number of initiatives centred on IoT and the use of data analytics. In Manchester for example, a programme called CityVerve has been created, bringing together experts in IoT to deliver smart technology in a real living, working city. One example is the introduction of talkative bus stops, which lets bus operators know when commuters are waiting but also encourages the public to do more physical activity through sensors in parks and other sites along commuter routes. These sensors and the data analysis that takes place allow the delivery of a personal, efficient and flexible service. In Oxford, another example is the Flood Network. This scheme offers the residents of a flood prone area the chance to install a low-cost flood monitor which collects data on nearby water levels and provides feedback online. Harnessing the power of IoT, the sensors give live updates and can even visualise this on a digital map. The way this really makes a difference though is the fact that not only residents receive the data, forecasters and flood experts also have access to this in order to reduce response time and improve the community’s flood defence systems. Seagate and IDC’s recent study, The Data Age 2025, also found that 20% of the data in the global datasphere will be critical to our daily lives and nearly 10% of that will be hypercritical – the Flood Network is just one of many examples highlighting this fact. Where will all of our data go? Industries and governments alike talked about a data explosion some years back but that was a largely user-driven phenomenon when mobile devices enabled consumers to become content developers and generators. Today, IoT-enabled edge devices are a key driver of growth for data volumes. Devices come with limited data storage capacity which means that the data they generate needs to be offloaded elsewhere for storage and analytics. While not all the data that is collected from users and devices will need to be analysed, data centre and cloud service providers should look at what new and creative storage solutions are required by governments and businesses in order to address concerns of cost, storage locality and security. What does the future have in store for IoT? The concept of IoT has been discussed since as early as the 1960s but with the cost of sensors, connectivity and compute significantly reduced, we are now able to deploy new projects and solutions at a faster pace. Today, the IoT is no longer an optional choice for businesses and society. 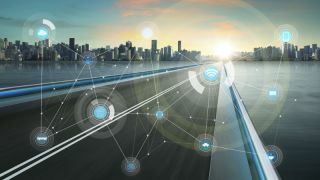 Service quality, experience, timeliness and responsiveness to customers have become competitive differentiators that determine the survival of organisations and the potential of smart cities to address these problems is almost limitless. The role of the IoT is to help consumers and businesses simplify data, generate value and democratise access to information, commerce and services for everyone. To ensure that citizens are being provided with this, all cities must implement the technologies that will bring them into the modern age. In order for a city to be truly smart, the way it interacts with data must change in a considerable way. Those that embrace this will see the impact it has and I look forward to seeing the transformation of more and more cities in the very near future.